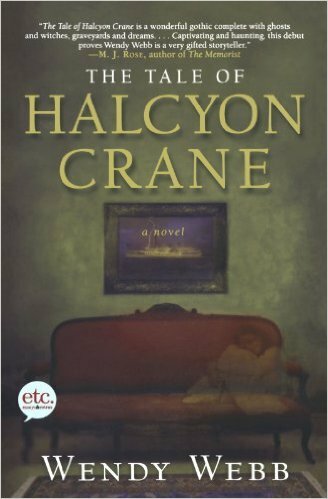 The Tale of Halcyon Crane by Wendy Webb. In search of answers, Hallie travels to the place where her mother lived, a remote island in the middle of the Great Lakes. 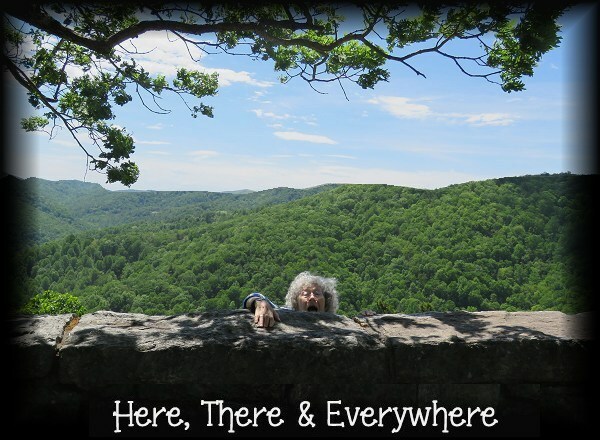 The stiff islanders fix her first with icy stares and then unabashed amazement as they recognize why she looks so familiar, and Hallie quickly realizes her family's dark secrets are enmeshed in the history of this strange place. But not everyone greets her with such a chilly reception--a coffee-shop owner and the family's lawyer both warm to Hallie, and the possibility of romance blooms. And then there's the grand Victorian house bequeathed to her--maybe it's the eerie atmosphere or maybe it's the prim, elderly maid who used to work for her mother, but Hallie just can't shake the feeling that strange things are starting to happen . . . This is my second book by Wendy Webb. (not a series). The First one I read by her was The Fate of Mercy Alban. This book, The Tale of Halcyon Crane is a fabulous book for the Fall and for those who like ghost stories! To be honest I am not a great "ghost story" lover, but this was a really good book! Some who know me will be shocked that I've read a book that doesn't take place in the UK. Even the author is from the USA! lol. However, she did great "island building" so that you felt you were on this remote Island with the locals who lived there year round yet made most of their money during the summer from tourists and from the rich who kept "summer cottages" on the Island. So if you like books that have "deep dark secrets" to reveal and a good ghost story you will certainly enjoy this book. The Harvest Man by Alex Grecian. Not so Sergeant Nevil Hammersmith. Rash actions have cost him his job, but that doesn’t stop his obsessive hunt for the Ripper. When the mutilated bodies of prostitutes start turning up again, Hammersmith enlists the help of a criminal network to stop Saucy Jack, his methods carrying him further and further from the ideals of the Yard, so far in fact that he may never be able to find his way back. Of course, the Ripper’s been playing a game with him—with Walter Day, as well. He is pushing both of them to their limits, and what happens when they get there . . . no one can say. 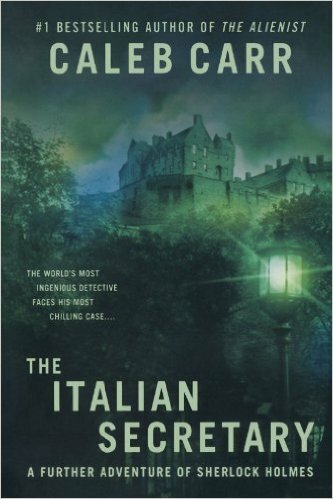 This is the 4th book of the Scotland Yard's Murder Squad that Alex Grecian has written..and the fourth book of his I have read! OMG! These Alex Grecian books just keep getting better!!! This one open with a 3 page "preface" that is such a "Hook" you can't put the book down! I mean.... this book contains three, (count them! THREE) murderers! And one is: of course, Jack the Ripper. 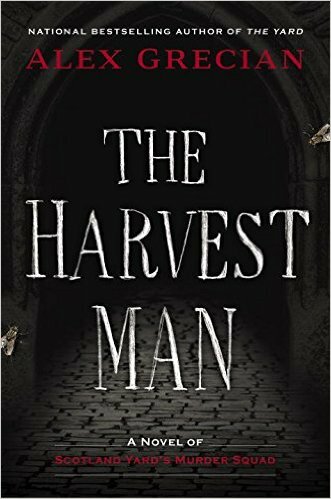 But the main hunt is for "The Harvest Man". I don't think I want to describe his murders to you because they are gruesome! Yet they make perfect sense to the murderer. The first three Grecian books: The Yard, The Black Country, and The Devil's Workshop were all terrific, and could if wanted, be read without following the whole series. The Murder Squad uses the same characters, however the first 3 books all have a beginning, middle, and end... where as........................... The Harvest Man is left a bit of a cliffhanger! And the next book doesn't come out until next MAY!! I was fine waiting for the new books when there wasn't a cliffhanger!!! Why did he have to go and do this to me??!! ARGH!!. This is an excellent book and one I couldn't put down. Excellent "Scotland Yard" stories if you are into that sort of thing. The Italian Secretary by Caleb Carr. This is my second book by Caleb Carr, the first being The Alienist. This is a Sherlock Holmes story. Generally, I am not the biggest fan of Holmes books that aren't by Doyle, but since I liked the writing of the first Carr book I decided to give it a go. His writing is really good. The old Holmes language is used and I had no problem hearing Basil Rathbone's voice for Sherlock. (As much as I love Benedict Cumberbatch, Basil Rathbone will always remain the "original"). Carr used the familiar characters of Watson and Mycroft, but put them in Scotland instead of Baker Street. Still if you are a Holmes fan, even if Doyle isn't the author I would say you would like this book. The only problem, at all, that I had with this book was, "Holyroodhouse". I won't tell you how many times I read "Hollywoodhouse".. *sigh*. This would be a good "carry along" book. Not big in pages and there's not many who don't like Sherlock! "A compulsively readable story that starts as a conventional murder mystery and morphs, by degrees, into a horrifying supernatural thriller," The Guardian said of Mayhem. A virtuoso fantasy writer, Sarah Pinborough has won numerous awards including the British Fantasy Award for Best Short Story. 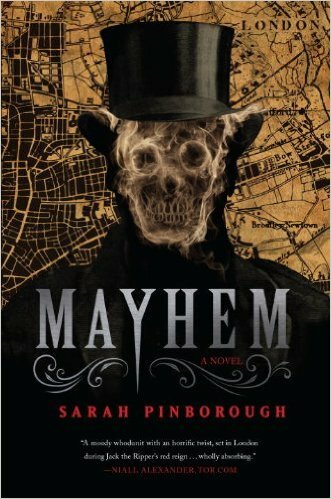 In Mayhem Pinborough turns her attention to one of the most baffling and notorious crime sprees in Victorian times. 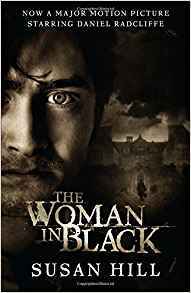 Already frustrated in their attempts to capture serial murderer Jack the Ripper, the detectives of Scotland Yard are suddenly confronted with a new monster, dubbed the Torso Killer for his habit of leaving behind neatly wrapped parcels of his victims' body parts, minus the heads. With the terrible increase in mutilated corpses to examine, the highly regarded police surgeon Dr. Thomas Bond has lost the ability to sleep. True, a growing dependency on opium affords him some solace in his loneliest and most desperate hours, but he also fears the grip of the drug. During Dr. Bond's nightly tours of London's underbelly in search of pharmaceutical respite from the horrors that plague him by day, he encounters a mysterious Jesuit priest scouring the opium dens himself, clearly in search of someone--or something. The doctor at first rejects the strange priest's unnatural theories about the Torso Killer as an affront to scientific thought. But over time Dr. Bond's opium-addled mind begins to crumble under the growing impression that there might be some awful truth to the Jesuit's ideas. Poor England back in the 1800's, just how many mass murderers can London have?!!! Of course I liked this book. The time period and being in England, and I've read a number of books over the years about Jack the Ripper .. and having recently come from reading The Alienist, this followed right along with the "descriptions" of the murder victims. So if you have a weak stomach you might want to skip this one. I am not one to enjoy much "supernatural" but it was written well so I really did enjoy the book! Anyone who knows me knows that I really don't write a "review" since I do generally buy my books by the Amazon review, I figure many others would. All I can add to it, without giving more away, is that if you like period piece mysteries/ murders and such then this book should go on your list. Well, this certainly is the perfect book for RIP! I am not usually into ghost stories but this one was done really well. Just the fact that it depended on the tide to get to the house in question was enough to make ME want to stay away! I didn't see the movie when it came out and had wanted to since it was Danielle Radcliff. Maybe I will consider picking up the movie! The Amazon review is a better review than I could ever give. I did find that it was one of those books you pick up immediately upon sitting down in your favorite chair. Since it isn't a big book you read it rather quickly! If you still need a book to read.. this would be a perfect read! My first book for RIP.. I have read In the Garden of Beasts: Love, Terror, and an American Family in Hitler's Berlin by Erik Larson and liked it so I thought I'd give this a try. (also heard it's being made into a movie). 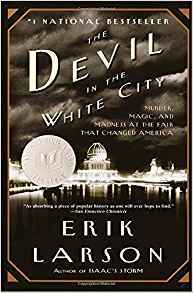 I have to say most of the book was about the building of the Cleveland Words Fair, and less about the serial murderer that seemed to attach himself to being by the Fair to draw in more victims. So for me the building of the Fair was slow and not very exciting to me. Historically, which I generally like reading about, I learned a few things (not much). And through a lot of the book they barely mention the murderer Dr. Holmes. He was finally given a whole chapter at one point to peek your interest but it wasn't until near the end that you finally really learn about him. So for me this was a slow reader.